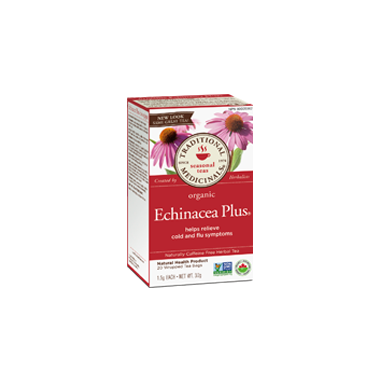 Traditional Medicinals Organic Echinacea Plus is an herbal tea traditionally used to fight off colds, flus and infections, especially of the respiratory tract. Recommended dose: Adults and children over 12 years: Drink 5 cups daily at the first onset of symptoms and reduce 1 cup per day for the next five days. Repeat as needed. Directions of use: Pour 240 mL freshly boiled water over 1 tea bag and allow to steep, covered, for 10 to 15 minutes. Gently squeeze the tea bag to release the remaining extractive. Duration of use: May be used up to 10 to 21 days. Medicinal ingredients: Each tea bag (1.5g) contains: Organic purple coneflower herb (Echinacea purpurea) 1,065 mg*, organic purple coneflower root (6:1 extract) 37.5 mg (Echinacea purpurea) equivalent to 225 mg of purple coneflower, organic narrow-leaf echinacea herb (Echinacea angustifolia) 30 mg*. Non-medicinal ingredients: Organic West Indian lemongrass leaf (Cymbopogon citratrus), organic spearmint leaf (Mentha spicata). Cautions: Consult a health care practitioner before use if you have rheumatoid arthritis, an auto-immune disorder or a progressive systemic disease such as tuberculosis, leucosis, collagenosis, multiple sclerosis, AIDS or HIV infections. Consult a health care practitioner prior to use if you are taking immunosuppressants, or if symptoms persist. Contraindications: Do not use if you are pregnant or breastfeeding. Do not use if you have an allergy to Asteraceae/Compositae (the daisy family) plants. * Grown in the U.S.A.
Love its taste and it's a good natural alternative when a cold is coming. This tea is so hard to find in the stores, I was thrilled to find it on the website and add it to my order. Will definitely reorder. My favorite tea for my family when we feel a cold coming on. Not my favourite tea; I find that it actually makes me feel a little nauseated, but maybe I'm sensitive to some of the ingredients. I did not notice much improvement in my cold symptoms. My favorite alternative med when I have minor cold/flu. This is my favorite natural remedy when I have minor symptom of flu/cold, which is a much healthier resolution than taking western drug. Great to take when you feel a cold coming on, pleasant flavour as well.